For most toddlers, pretending to be strong and determined like a dinosaur is adorable but they haven’t usually experienced much in their little lives that requires serious strength. 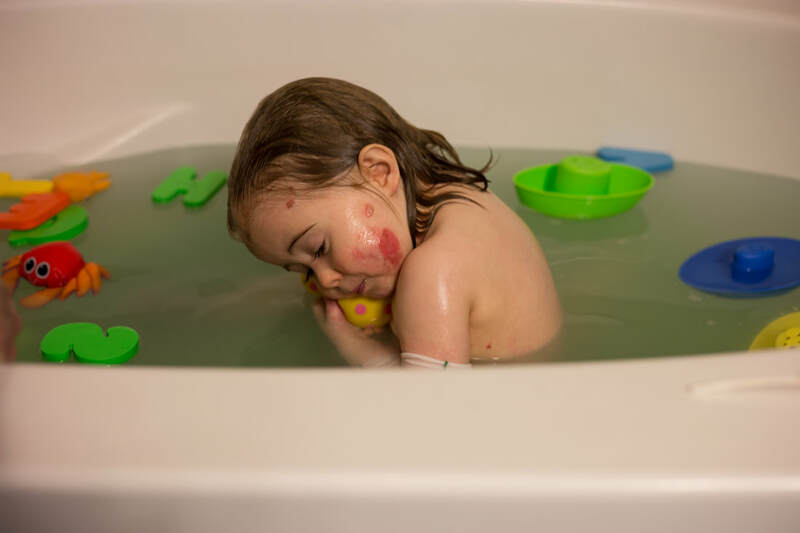 However, Rowan was born with Recessive Dystrophic Epidermolysis Bullosa and has experienced more than any child should. The effects of Rowan’s EB are felt in every part of our life. She has to stay indoors for the entire summer, because Texas heat causes Rowan’s skin to break down. I know every Monday, Wednesday and Friday morning we will spend three to four hours carefully washing Rowan’s skin, lancing blisters, and applying new bandages. My husband and I sleep with our daughter between us so that we can stop her from itching and rubbing skin off of her face, neck and chest. I don’t wear my engagement ring because it can take off her skin by accident and we use white bed linens because they can be bleached if the blood doesn’t come right out in the wash. Even the smallest details of our day are planned and prepared for due to her EB, like even getting in and out of the car and what type of food I cook for dinner. The amount of pain and suffering those with EB deal with is almost incomprehensible. Ultimately, the things that help us cope is how joyful she is even in spite of everything, and we take hope in the fact that research for a cure is being sponsored by EB Research Partnership. My greatest hope is that one day my daughter and those like her can live a normal pain free life.